The TAG Heuer Formula One Womens Watch model number WAH1211.BA0861 is the ultimate in high fashion sport design. 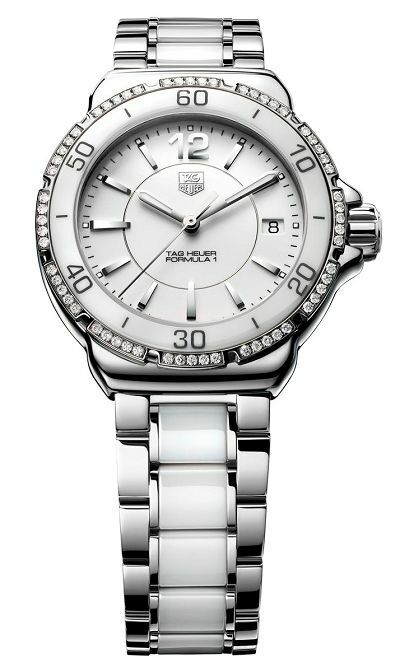 TAG Heuer watches are coveted by men and women alike, but this watch is all for the ladies. Offering the ever modern white bracelet, the Formula One women’s watch is sophisticated and a bit trendy. This watch is for the modern woman who desires a high quality timepiece, with pizzazz. The TAG Heuer Formula One WAH1211.BA0861 women’s timepiece is a Swiss Quartz model and is battery operated. The precision of Swiss Quartz means you’ll always be on time. The dial on this women’s watch is white, with a scratch resistant sapphire crystal covering. The case is polished stainless-steel and measures 37mm in diameter. The bracelet on this women’s watch is crafted in both steel and white ceramic. The white ceramic inner link of the bracelet stands out against the polished steel. The bracelet is finished with a fold over clasp for added safety. This watch by TAG Heuer is water resistant to 200 meters and carries a 12 month manufacturer’s warranty. The TAG Heuer Formula One WAH1211.BA0861 women’s watch is both luxuriously stylish and highly functional. It is reasonably priced, and worth every penny. is this watch surrounded by diamond? or crystal? can u please reply me ASAP?